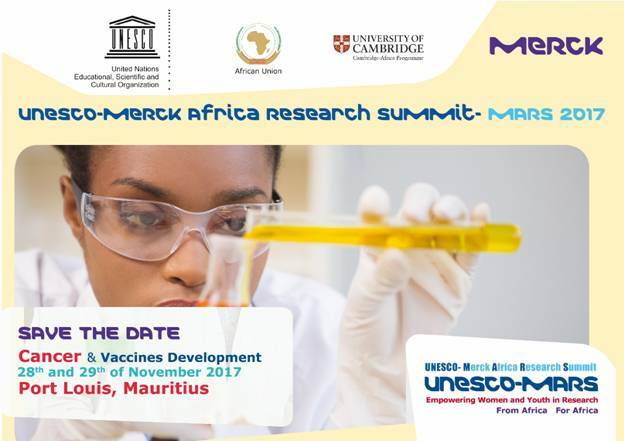 As part of “Merck STEM Program for Women and Youth ”: the UNESCO Merck Africa Research Summit – MARS 2017 will be held in Mauritius with the aim to empower Women and Youth in Research under the patronage of the Head of State of The Republic of Mauritius, H.E. AmeenahGuribFakim. UNESCO-Merck Africa Research Summit- MARSaims to bring together researchers from across Africa to discuss the generation, sharing and dissemination of research data and to prepare for the road ahead in Africa’s development as an international hub for research excellence and scientific innovation. UNESCO-Merck Africa Research Summit – MARS2017 will have scientific support from UNESCO (United Nations educational, scientific and cultural organization), African Union Scientific, Technical and Research Commission (AU-STRC), the University of Cambridge, UK, University of Rome, and Merck. “The annual Summit aims to contribute to building research capacity in the African research community, with special focus on “The Role of Scientific Research in responding to Cancer and Vaccines Development – two emerging challenges in Africa”. The Summit will also showcase innovative research taking place in projects, programs and initiatives across African universities and the wider African research community,” said Dr.RashaKelej, President of “ Merck STEM Program” , Chairman of the Steering Committee of the summit and Chief Social Officer, Merck Healthcare. The summit is a unique opportunity for Africa’s young and women scientists to share their research output and findings with the top echelon of scientists from Africa and abroad. It is also an opportunity for networking and career development. The Summit will present a platform where young scientists will be able to discuss the enabling environment for better research among others. On another note, the organizing committee will present the “Best Young African Researcher Award” and the “Best African Woman Researcher Award” to recognize the outstanding contribution of African female scientists with aim to promote women in research and advance their contribution to STEM (Science, Technology, Engineering and Mathematics). In 2016; UNESCO and Merck celebrated outstanding African Women Researchers for the First Time. Kenya, Botswana, Burkina Faso, Gabon, Uganda, Ethiopia ranked the first five places in “Merck Africa Women Research Award” on women health in Africa. 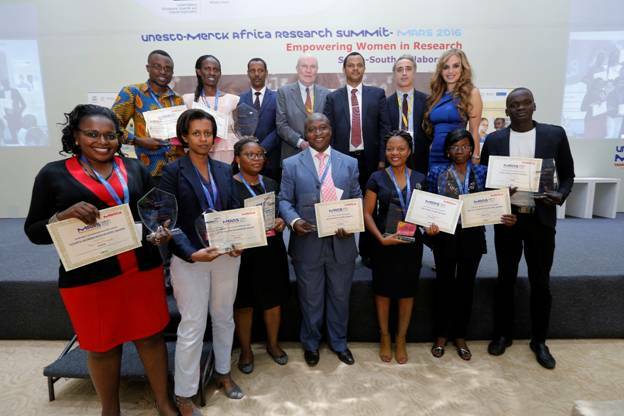 Merck has announced five winners from Kenya, Burkina Faso, Gabon, Uganda and Ethiopia under the category of ‘Best African Women Researchers Award’ and four winners from Botswana, Cameroon, Gambia and Zimbabwe for ‘Best Young African Researchers Award’ during the recently held 2nd UNESCO-Merck Africa Research Summit in Addis Ababa, Ethiopia. 2016 was the first year the ‘Best African Women Researchers Award’ was being launched. “The annual Summit – UNESCO-MARS – will address the vital role of research in the improvement and sustainable development of population health with specific emphasis on how to translate knowledge into action – the ‘know-do gap’ – to improve health and make an impact on society,” added Rasha Kelej. Abstracts are invited from final year African PhD students and young investigators involved in research related to both Cancer especially in Women and/or Vaccines Development. All should be primarily based at African research institutes and Universities, although collaboration within Africa as well as outside is encouraged. All abstracts will be peer reviewed. · All abstracts will be peer reviewed and 100 winners will be eligible for sponsorship. · First three winners will be eligible for further number of Research Awards. · Further Research Awards will be dedicated forthe Best Five African Women Researchers.